Recently launched in the USA on December 1, 2018, Luin Living has a vision of bringing simple indulgence to every home, every day. Our product line boasts a luxurious collection of products for body, bath and home in timeless colors and designs for all ages and all genders. Prebook your appointment to visit with us and receive a complementary hair towel or spa basket. The Hair Towel has the added convenience of a clip, so it will stay securely in place. One size suits all ages and hair lengths. Machine wash max 140 °F. Tumble dry to maximize softness. Avoid fabric softener as it reduces absorbency. Fall in love with our natural harmonic color palette which we believe is one of the basic elements for relaxation. The large hood, pockets and buttons on both sides makes our poncho even more relaxed to wear. 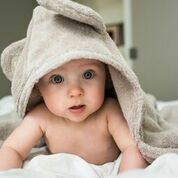 Every parent knows you only have a few seconds to dress your little one after a bath. 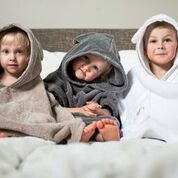 Meet the Poncho towel: perfect for little family members, these ultra luxe poncho towels are easy to put on and stay put even during playtime. We also included big pockets for toys and treasures, and teddy bear ears on hood for extra smiles. First Class Oeko-Tex certification guarantees no harmful substances are used in production.